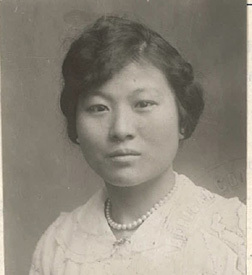 “Photo of Mrs. Lai Ziang Bryant,” 1919, Chinese Exclusion Act case files, RG 85, National Archives-Seattle, Mrs. Lai Ziang Bryant case file, Seattle, Box 1263, 36351/2-1. Lai Ziang was born in Hankow, Hupeh Province, China on 11 May 1897. In 1919 she was living with her mother and sister in Shanghai; her father was deceased. Her sister, Mrs. Joseph D. Jensen, was a widow with children whose Danish husband died about 1915. On 6 February 1919 Lai Ziang married Charles Robert Snaith Bryant, a master licensed mariner, at the American Consul. He was 42 years old and she was 21. When they arrived in Seattle in April 1919 their marriage certificate was examined by Immigration officials and returned to them. It stated that Charles R. S. Bryant was born in Minneapolis, Minnesota and they were united in marriage by Rev. G. A. Fitch, a duly ordained minister of the American Presbyterian Church. The witnesses for her 1919 application were Neville Craig, U.S. Court for China, and Walter H. Meyers of Seattle, Washington. Her application was approved. The Bryants left Seattle again in 1931. A letter in the file says she was identified by photographs and her Certificate of Identity No. 58341. [They made sure they had the paperwork in order this time.] There is no more information in the file after 1931.